Continuing with the classic combination of chocolate and peanut butter, this time in the form of a whoopie pie! Cream the sugar and egg together until light and fluffy. In a separate jug or bowl, pour the yoghurt, milk and vanilla and stir. Gradually add this to the sugar and egg mixture. Mix on a low speed until everything is well combined, then mix in the melted butter. In another bowl, sift together the flour, cocoa powder, baking soda and baking powder. Add half to the batter and mix well on a low speed and then add the remainder of the dry ingredients and mix until the mixture is smooth. Add the peanut butter and mix it in. Chill the batter in the fridge for 20-30 minutes. Preheat oven 170°C (325°F) Gas Mark 3. Line some baking trays with greaseproof paper, or grease your whoopie pie tins. One the batter has cooled, spoon the mixture onto the trays/ whoopie pie tins. If you are using a baking tray the mounds of dough should be 3-5cm in diameter, with enough space around each to allow them to expand (2-3cm) the mixture should make between 16 and 20 mounds. 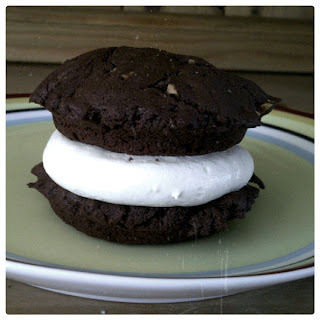 (When I made them I used my whoopie pie tin and it made a lot more). Bake in the oven for 10-13 minutes or until the sponge bounces back when pressed. Allow them to cool completely on a wire rack. While the sponges are baking, get a new bowl and mix the icing sugar and butter together until smooth. Add the marshmallow fluff (available from sellers on eBay, or if you live in Northern Ireland I know that it is available from the Rinkha in Islandmagee) increase the speed and mix until the filling is light and fluffy. Chill in the fridge for 30 minutes to firm up. To finish, layer your whoopie pies, one piece of sponge, spread 1 tbsp of filling on top of it then top with another piece of sponge. The sponge mixture for these whoopie pies was a much more firm than the ﻿mixture for the sponge of the Banana Cream Whoopie Pies I had made before and didn't spread at all in the whoopie pie tin so I pressed the batter into the tin.